NCTA members can download the Spring 2016 edition of the Translorial in print and downloadable PDF versions, covering a variety of topics. If you are not an NCTA member, you can join here. → Read more (members only). It is not every day that one has the opportunity to meet a world-class researcher in conference interpretation. The International Association of Conference Interpreters (AIIC), as part of its Training of Trainers series, sponsored a seminar led by Franz Pöchhacker for teachers of conference interpretation. Sessions were held in Rome, Italy, January 29 through February 1, 2016. At the NCTA General Meeting of September 12, 2015, Briony Everroad, a freelance editor with a special interest in literary translation, spoke about the challenges and joys of finding books worth translating, editing, and marketing. On the occasion of NCTA’s last general meeting of 2015, members were given the opportunity to listen to and participate in Mr. Robert Finnegan’s presentation on Timor Leste. Mr. Finnegan is a former US Army missile repairman, Christian missionary, certified translator, and contract interpreter with the US Department of State. John Di Rico, Sales and Marketing Manager for Wordfast, also runs ApexTra, a small translation company in France. He presented a second workshop on October 17, 2015 on using the CAT tool Wordfast at the SFSU downtown campus in San Francisco. 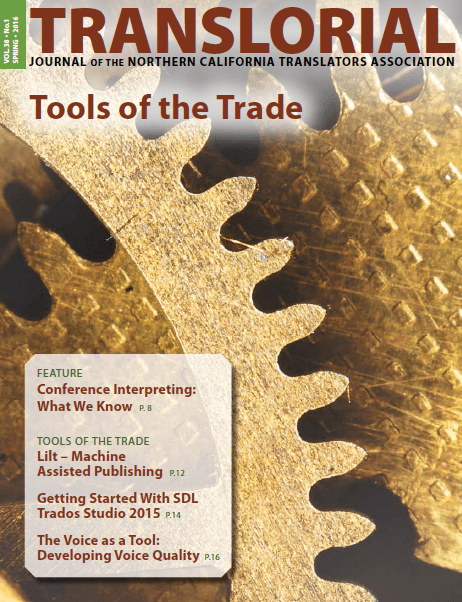 An information-packed, NCTA-hosted SDL Trados Studio 2015 workshop for beginners by Tuomas Kostiainen. A workshop on voice training for interpreters and voice-over practitioners by Cyril Flerov. On Saturday, February 13th I had the pleasure of attending Michael Schubert’s presentation, Getting Started as a Translator. Kermit Clum, CPA and owner of Key Financial Solutions, offered an overview of the basics for newcomers and seasoned professionals alike. translorial posted this article under Business Tools, Getting Started, Interpretation, Machine Translation, NCTA Events, NCTA Meetings, Worthy of a Visit	on Sunday, May 1st, 2016 at 11:43 pm	You can follow any responses to this entry through the RSS 2.0 feed. You can leave a comment or trackback from your own site.